Extrusion welding allows the application of bigger welds in a single weld pass. 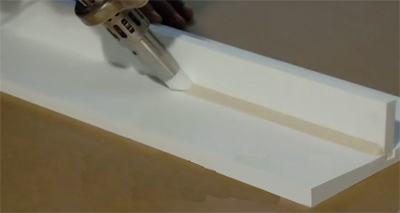 It is the preferred technique for joining material over 6 mm thick. Welding rod is drawn into a miniature hand held plastic extruder, plasticized, and forced out of the extruder against the parts being joined, which are softened with a jet of hot air to allow bonding to take place. Hot gas welding, also known as hot air welding, is a plastic welding technique, which is analogous to metals, though the specific techniques are different. A specially designed heat gun, called a hot air welder, produces a jet of hot air that softens both the parts to be joined and a plastic filler rod, all of which must be of the same or a very similar plastic. Hot air/gas welding is a common fabrication technique for manufacturing smaller items such as chemical tanks, water tanks, heat exchange and plumbing fitting. 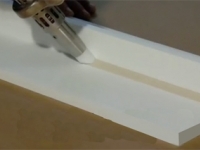 Two sheets of plastic are heated via a hot gas or a heating element and then rolled together. This is a quick welding process and can be performed continuously. With speed welding, the plastic welder, similar to a soldering iron in appearance and wattage, is fitted with a feed tube for the plastic weld rod. The speed tip heats the rod and the substrate, while at the same time it presses the molten weld rod into position. A bead of softened plastic is laid into the joint, and the parts and weld rod fuse. With some types of plastic such as polypropylene, the melted welding rod must be “mixed” with the semi-melted base material being fabricated or repaired. These welding techniques have been perfected over time and have been utilized for over 50 years by professional plastic fabricators and repairers internationally. Speed tip welding method is a much faster welding technique and with practice can be used in tight corners. A version of the speed tip “gun” is essentially a soldering iron with a broad, flat tip that can be used to melt the weld joint and filler material to create a bond. Contact Our Customer Service Department For Assistance With Locating A HDPE Welding Rod Company That Uses King Plastic Material For A Perfect Color Match.